Most of us will encounter someone who has thought about or attempted suicide. Likewise, most of us may not know what to say or do when someone tells us they are thinking about suicide or have tried it. Therefore, it is important to get immediate help for someone who wants to commit suicide. It is also important that they receive counseling so that they can effectively deal with the suicidal thoughts and the life issues that may be involved. The purpose of this article is not to be a comprehensive guide to counseling someone about suicide, but to provide high level tips on why Christ-centered counsel about suicide is important. What do we know about suicide? According to Wisdom4Today, the Bible shows us that suicide is an event that has also been documented as having a major impact on those whom are suicidal and their families (2): “Suicide is not a topic that lacks any mention in the Bible. There are several instances where people have committed suicide. The first person mentioned that committed suicide was King Saul, the first King of Israel. We can read of his suicide in 1 Samuel 31:1-6.” In addition to others that committed suicide, we can read of the suicide of Judas Iscariot in Scripture (Matthew 27:3-5) as well as the prophecy of his demise in Psalms 106:6-18. Since this is an issue that affects humanity, God has also provided clear guidance in the Bible for dealing with suicide as well as all other life issues (2 Timothy 3:16-17). Make sure they are safe. In the Lord’s example, He was confronted by an angry crowd that wanted to stone an adulterous woman. His first step was to make sure she was safe so He dealt with the danger from the crowd before saying anything to her (John 8:1-9). Using the Lord’s example, we must make sure that the suicidal person is safe. We must not spend time debating why or why not suicide is an option despite what has happened. This means we must not hesitate to get police and emergency medical services involved right away so that the person is not in a position to cause themselves harm and can be helped in a safe environment. Do not condemn them. In the Lord’s example, His second step was to not condemn her or start preaching to her about what she did (John 8:10-11a). Using the Lord’s example, we must establish a trusting relationship with the suicidal person and make it clear we are not there to condemn them. Getting in someone’s face and telling them they are going to burn in hell, especially if they do not know you, is the worst thing that many so called Christians do. It destroys any willingness to listen to anything any Christians say about the love of Christ that is desperately needed in their life. Redirect their focus to a better future. In the Lord’s example, His third step was to tell the woman to “go and sin no more” (John 8:11b). Using the Lord’s example, we must not send the person off to deal with their issue on their own. We must be committed to take the time and effort to help them or to get them help. If we notice that right after this the local religious authorities gave Jesus a hard time about His teachings and He addressed them directly (John 8:12-28). We must not get side tracked into debates about what others want to do to help or respond to attacks on what Christ-centered counseling can do. We must let the Lord’s Word directly prove to critics the value of Christ-centered counseling on its own by the results without any argument from us. This will show the suicidal person we are not there to argue with others that they may see as well intentioned. Show them that God can help them. In the Lord’s example, His fourth step was to lay the foundations of the source of His wisdom, power, and truth to address all the issues of life (John 8:29-30). Using the Lord’s example, we must present to the suicidal person that the Word of God is able to give them simple, practical instruction that makes sense and really works. This means we must help them really understand what is taught from the Lord in John 10:10. They must know that we can have eternal life through Him as their Savior and learn how to have an abundant life through Him as their Lord by the power of the Holy Spirit. If they do not first trust Christ as their Savior do not let that stop us from continuing to show them from His Word what He teaches. Many times, people have trusted Christ as their Savior weeks later after they have seen the simple truth and teaching of God’s Word practically impact their lives. Continue to disciple or train them. In the Lord’s example, His final step was to establish the people that believed Him in the beginning of discipleship or training so that they can know the truth and be set free from the issues of life. Using the Lord’s example, we must continue to train or disciple the suicidal person so that they establish the habits and study practices of God’s Word so that they grow closer to Christ (Read Grow Closer to Christ in 30 Days). As they do this, then they begin to see what happened in the light of the wisdom and understanding of God and can grow on to being Spiritually mature so that suicide will not be even considered as an option any more. 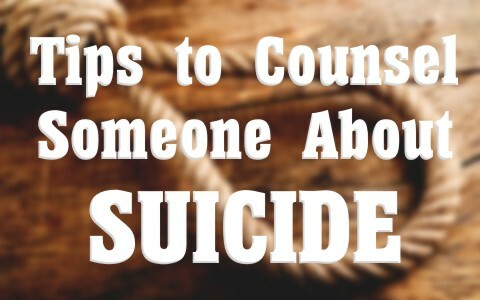 While these are very basic tips to counseling someone about suicide, there is so much more that takes place in the initial weeks and months after starting Christ-centered counseling on suicide. In my experience, it is not long that the formerly suicidal person and I are able to go back and discuss the events leading up to what happened. In the process for the first time they are able to really see how out of touch they were with the reality of suicide and knowing that God has a wonderful plan for their life. I would argue that God does not have a “wonderful plan for our lives”. He promises the Christian persecution in this life, (2 Tim 3:12). Your text involves a promise to the nation of Israel as they began their 70 years of exile in Babylon(Jer 29:11), not a message to the individual believer. Hebrews 11 tells us what to expect as believers and it is not pretty. We live in this Western bubble where Christians are not persecuted anywhere near to the extent that they are in other parts of the world. I agree that we need to come alongside those with suicidal thoughts and minister the Word of God and be there for them as support during their dark hours without condemning words. God does not send any believer to hell who commits suicide. As you know, there are so many various reasons to suffer great depression including chemical imbalances. I have personal experience with suicidal ideation that I suffered for years. I have prayed for the strength to take my own life. How twisted is that to pray to the God who made me to have Him help me to do the very act He did not want me to do. One of the things that helped me was to be reminded that I would be with Him soon and out of the situation which drove me to despair. Looking at eternity and this relatively short time we are here on earth was of much help. Reading and listening to others who had similar or much worse problems than myself also helped me to realize I was not alone. I took courage in seeing and hearing about their battles and how they survived often with great courage to face another day. I knew God was helping me in turn take courage to go one more day and to focus on the minute by minute journey and not so much on the long haul, because I did not see any light at the end of that tunnel while on earth. So I thank you for bringing up this subject which has been a huge part of my life. I hope many will read this article and take solace in the thoughts expressed. Previous post: Is Theistic Evolution True? Next post: Where Was God During The Holocaust?